The gaunt ruins of Castle Tioram stand on the tidal island of Eilean Tioram near the point at which the River Shiel flows into Loch Moidart. It is reached along a little over two miles of narrow and bumpy single track road which leaves the (also single track) A861 at the north end of the bridge over the River Shiel, which is itself at the northern end of the scattered settlement of Acharacle. Castle Tioram is pronounced "Cheerum", and you can find quite a few variations on its name, from Casteal Tioram on some editions of Ordnance Survey maps (but not others) to "Castle Tyrrim", "Castle Tirrim", "Castle Tiorim", and even, as you'll discover if looking it up in David MacGibbon and Thomas Ross's definitive guide to Scottish castles published in 1892, "Castle of Ellan-Tirrim", which we assume is how they heard "Eilean Tioram". The minor road terminates close to a car park in the woods just behind the shore, and from here it is a fairly short walk along the beach and across the sandbar causeway between the island and the mainland. 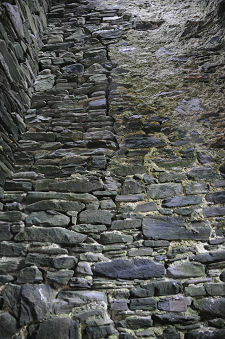 The state of this causeway suggests that it is probably passible in all but the highest tides, but the need to keep the tide in mind when crossing to the island is the first of a number of issues of personal safety that visitors to Castle Tioram should think about. There is no shortage of signs highlighting some of the other dangers of getting too close to the castle, not least because of the past collapse of part of the north west wall which makes exploring the beach on that side of the castle a risky business. Oddly, though, only a fairly ramshackle wire mesh fence warns visitors they are approaching the greatest danger on the island. As you pass the north east face of the castle, home to its only gateway, your proximity to a sheer drop to the rocks below is far from obvious. This is certainly a place where it pays to keep your wits about you. 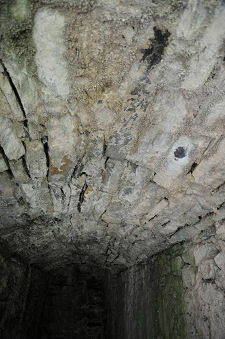 Access to the interior of the castle is prevented by the blocked up gateway, on which you find another warning sign. Except that when we last visited, in Summer 2012, the gateway wasn't blocked up, and entry was obviously possible. We went in to take the photographs shown on this page, but we'd strongly advise against anyone else doing so. There are multiple dangers here that have to be taken very seriously indeed. Vegetation growing out of the tops of many of the walls is a sure sign of instability, and more compelling evidence of this is easy to find in the form of freshly fallen stones on the floors of many of the interior spaces. 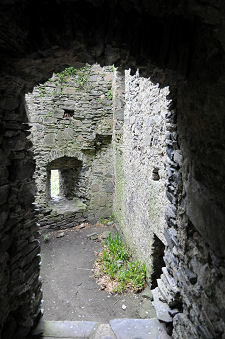 Other dangers include at least one corridor that simply ends in a sheer drop at a change in level between ranges; a vaulted ground floor corridor in which very little appears to be holding together the stones forming the vaulting; at least one badly broken door lintel leaving nothing obviously holding up the wall above; major vertical cracks that can be seen extending up through a number of floors in part of south west range; and treacherous steps leading up to the south east range. Oh, yes, and a resident population of pigeons, each of which can sound just like a stone dislodging when it takes off from a hole in the wall high above your head. 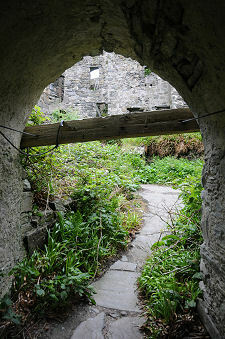 The interior of Castle Tioram is far larger than seems possible from the outside. 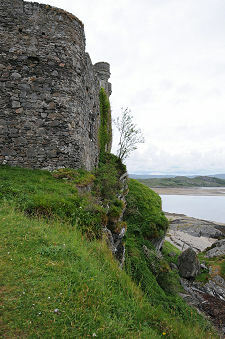 The castle comprises an irregular pentagonal curtain wall built directly onto the top of the rock of the highest part of Eilean Tioram. 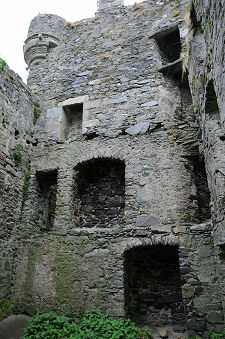 Much of the interior is taken up with a heavily overgrown courtyard on a number of different levels. Two ranges of buildings have been built against the interior of the curtain wall, which we've referred to here as the south east range and the south west range. Their existence is hinted at by structures appearing above the wall in views from the outside of the castle, but the main surprise is simply the sheer size of Castle Tioram, which seems comparable in scale to the most similar castle we can think of, Kisimul Castle on (or, more accurately, just off) the island of Barra. The earliest known fortification in the area was a fort from the Iron Age whose remains can still be seen a mile and a half to the south at Shielfoot, beside the River Shiel. But a tidal island with a rocky summit and a nearby sheltered beach ideal for ships would inevitably have offered an attractive defensive site. Evidence, in the shape of a bronze hanging bowl from the 600s now on display in the West Highland Museum, has been unearthed of settlement here from a fairly early date. The origins of the structure you can see today date back to the building of a castle at some point in the 1200s. 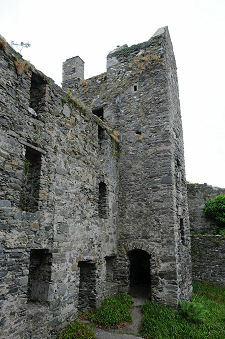 This would have comprised a curtain wall, following the irregular plan still evident, though probably of rather lower height as there is evidence of the walls being heightened later in the castle's life. Access was by the barrel vaulted gateway which remains the only entrance today. Over the following four centuries, Castle Tioram was altered and added to many times, but most of these changes affected the interior accommodation, with the result that the basic shape of the castle today would still be recognised by its original builders, some eight hundred years ago. In the early 1300s lands in this area were inherited by Christina MacRuari, and the island first appears in the public record in a charter in which Christina granted use of it, presumably complete with its castle, to Arthur Campbell, in return for his provision of a twenty oared-galley, and the men to row it, whenever she needed. Christina late passed the island to her half brother Ruari, and it was inherited by his daughter, Amy MacRuari, the divorced first wife of John of Islay, Lord of the Isles. Amy appears to have updated Castle Tioram, replacing (probable) existing wooden buildings within the courtyard with a stone tower house, which now forms the heart of the south east range. At the same time it seems likely that the walls were heightened and crenellated battlements added. After her death the area became the property of Ranald, eldest son of Christina and John of Islay. John of Islay had by this time married Princess Margaret Stewart, daughter of the future King Robert II of Scotland. Ranald subsequently became the first chieftain of Clan Macdonald of Clanranald and the grant to him of the "Castle of Elantyrim" was confirmed by Robert II in 1373. The Clanranalds played an important role in the often turbulent relations between the clans of the Highlands and Islands and the Monarchs of Scotland over the following centuries, and several chiefs were executed for taking up arms against the monarch of the day. The Clanranalds also had their fair share of conflict with other clans. Matters reached a head in 1554 when the Earl of Huntly was commissioned by Marie de Guise, the Regent of Scotland, to bring Lochaber under the control of the Scottish Crown. John of Moidart was Chief of Clanranald at the time. Huntly reached what is now Fort Augustus before deciding that an overland advance in this terrain was not going to succeed. 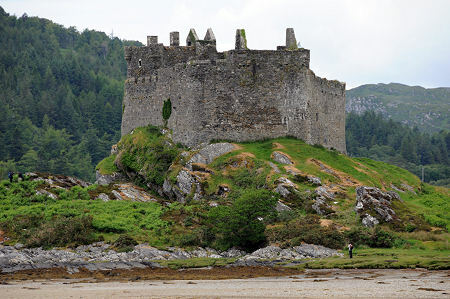 Instead the Duke of Argyll attacked Castle Tioram from warships and from an artillery battery landed on the shore. John of Moidart, who had been waiting for the Early of Huntly's army further east, rushed back to Moidart, captured the shore battery, and saw off the Duke of Argyll. 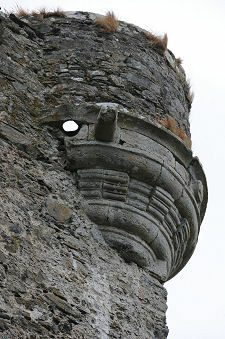 In the 1800s part of a cannon ball was found in the curtain wall, and is thought to date back to the attack by Argyll. The Clanranalds continued to play an important role during the difficult 1600s, backing the Royalists during the Civil War. They finished the century still in possession of Castle Tioram, albeit under the overlordship of the Dukes of Argyll. In about 1680 a major expansion of the accommodation of the castle took place. The old tower house was given an additional storey, and a new south west range was built against the inside of the curtain wall. It was little used, however, because in 1685 Allan of Moidart, 14th Chief of Clanranald, decided to live in a less remote location and moved out. Castle Tioram was recorded as being in a poor condition when occupied by a garrison of 14 government troops during the 1715 Jacobite uprising. It was recaptured by Allan of Moidart, who then, it is said, set fire to it to prevent its future use, before departing to meet his death at the Battle of Sheriffmuir (see our Historical Timeline). The Clanranalds again backed the losing Jacobite side during the 1745 uprising, but somehow managed to retain their estates until the early 1800s, and ownership of Castle Tioram itself and Eilean Tioram for another century after that. 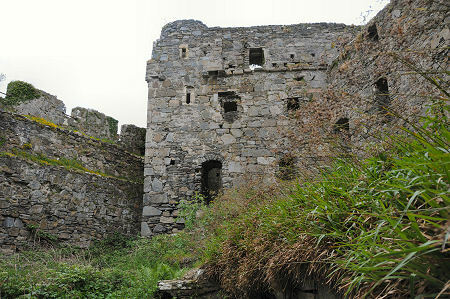 Work on consolidating Castle Tioram was undertaken in the second half of the 1800s by the neighbouring estate. The castle and island were sold in 1905, and then passed through the hands of a series of owners before being purchased by James Wiseman MacDonald in 1926. 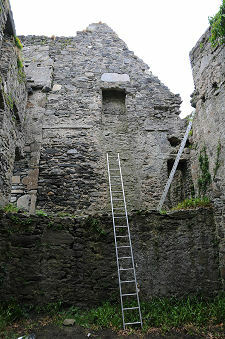 He subsequently worked with the Ministry of Works to conserve the ruins of the castle. 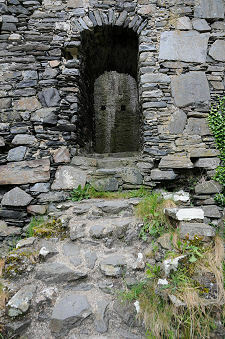 Several changes of ownership later, and the castle was again put on the market in 1996 with an asking price of £100,000. It was at first thought that the castle would be purchased on behalf of the nation by the government agency Historic Scotland, but they withdrew their bid when a local community group, the Clanranald Castle Tioram Trust, put forward a bid. As it turned out the castle was purchased in 1997 for £300,000 by Anta Estates. What followed was one of the most difficult and complex planning disputes that Scotland has seen: and one of the most unsatisfactory outcomes imaginable. Anta Estates lodged a planning application with Highland Council to convert the castle into a private house, which would involve building an access road, roofing and restoring the ruin, and putting in modern services such as electricity and plumbing. This would also throw into doubt the question of future public access. Planning permission was granted, but as the castle is a Scheduled Ancient Monument, Ancient Monument Consent was also needed, which Scottish Ministers on the advice of Historic Scotland (as it was then) said they were minded to refuse. A long Public Enquiry followed, which in 2002 found against proposals by the owner to convert the castle into a house. On the one hand, therefore, the owners still apparently wish to convert the castle into a home, but cannot do so because permission has been refused: while on the other the conservation bodies wish to secure the future of the castle as a romantic ruin which reflects 800 years of history and is fully open to the public, but cannot do so because they don't own it. The result is a standoff that has gone on for two decades, during which time the castle has continued to gently crumble away into the sea. The one thing that everyone agrees about is that Castle Tioram is a unique, and uniquely important, building: yet it seems that because it is so important a standoff has arisen that could easily lead to its total loss. The last time we looked, in August 2018, the Historic Environment Scotland website was suggesting that discussions had taken place (albeit quite some time previously) with the owners of Castle Tioram which might offer a way forward. Let us hope that progress can be made. The loss of a nationally important piece of our heritage through an inability to agree how to proceed would be a shameful indictment of Scotland as a nation.